A few months ago, Kitsap Opera presented “Carmen,” one of the greatest and sturdiest representatives of the genre, revered by opera buffs around the world. 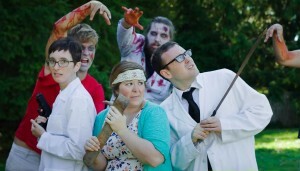 The founders of Kitsap Fringe Opera — Kelli McAuley and Heather Freese (front middle and left in the photo, with Brian Minnick and a zombie attack force) love them some opera, make no mistake. But they’re looking for a different and definitely a younger audience than “Carmen” drew. Hence “Maelstrom, a Zombie Opera,” a multimedia presentation that began life as a project by two members of a Portland State University student opera group, which Kitsap Fringe Opera will perform in three different Kitsap venues in the coming days. The opera, written by Ben Larson (book, lyrics and some music) and Reed Reimer (music), centers around Anna (played by McAuley), who is being treated for a fatal disease by a team of doctors and researchers in a hospital, when an alternate strain of her virus being developed by researchers turns out to be more than deadly. Anna and her husband, Jeremy (McAuley’s real-life husband, Terry), along with their doctor friends Claire (Freese) and Bryan (Minnick, a tenor from Tacoma Opera), must examine their friendships and relationships to each other as they are faced with their world crumbling around them. Who is worth saving? And who will be standing at the end? The show, directed by Scott Breitbarth (who also produced the film portions) also features a chorus of “zombies” portrayed by local actors, and a ballet choreorgraphed to the opera’s overture by Lynn Galletta and performed by students from her North Kitsap dance school. Music will be performed live by pianist Gwen Adams (artistic director at Poulsbo’s Jewel Box Theatre) and a quartet of string players from the Bremerton Symphony Orchestra. Performances are Oct. 21 at the Dragonfly Cinema (822 Bay St. in Port Orchard), Oct. 22 at Spacecraft at Rolling Bay Hall (10598 Valley Road on Bainbridge Island) and Oct. 31 at the See-Film Bremerton Cinemas, 655 Fourth St. in Bremerton, all starting at 7 p.m.. Tickets for all three performances are $15-$10 and are available through Brown Paper Tickets, 800-838-3006, brownpapertickets.com.